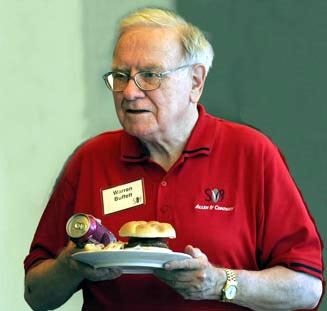 Warren Edward Buffett no Waren Bufet, Buffet, Bufett, Varren, Varen, Eduard. Berkshire Hathaway Incorporated Berkshire Hathaway Inc.
All time PORTEFEUILLE BRKA. Inc. : 26% - 51% of portfolio are stock , 18% - 39% bonds , 5% - 29% cash , 4% - 30% operating business. Stále v PORTFOLIO BRKA. Inc. : 26% az 51% portfolia jsou akcie , 18% az 39% dluhopisy , 5% az 29% peníze , 4% az 30% kapitál na rízení provozu. WARNING : Many of the following companies may have already been sold or taken over. They are rumored to have been owned by Warren Buffett, GEICO, or several Berkshire owned insurance companies. Along with other widely followed investors, Warren Buffett gets confidential treatment for regulatory filings that reveal stocks owned. These filings are not made public for a year after the SEC receives them. Anheuser-Busch (BUD) - world's largest brewing company . Was not good buy 2005 with P/B 13. Salomon Brothers ( stocks W.B. bought 1987 ). Salomon Brothers were acquired by Travelers Group in 1997, Travelers merged with Citigroup in 1998. USG Corp (USG). Was not good buy 2006 with earnings going down. Wrigley William Jr. Co. (WWY). 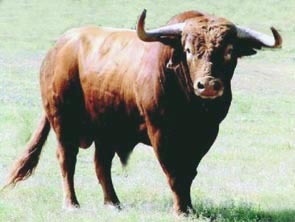 Was very expensive purchase April 2008 with P/E 35, P/B 7.8, P/S 4.0, P/C 20.7, ROE 25%, net profit margin 12%. 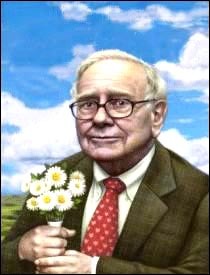 August 30, 1930: Warren Edward Buffett is born to his parents, Howard and Leila Buffett, in Nebraska. 1941: At 11, eleven years old, Warren buys his first stock. He purchases 6 shares of Cities Service preferred stock (3 shares for himself, 3 for his sister, Doris), at a cost of $38 per share. The company falls to USD 27 but shortly climbs back to USD 40. Warren & Doris sell their stock. Almost immediately, it shoots up to over USD 200 per share. 1943: Warren declares to a friend of the family that he will be a millionaire by the time he turns thirty, or "I´ll jump off the tallest building in Omaha." 1945: Warren is making USD 175 monthly delivering Washington Post newspapers. At fourteen years old, he invests USD 1,200 of his savings into 40 acres of farmland. 1947: In his senior year of high school, Warren and a friend purchase a used pinball machine at a cost of USD 25. Buffett begins to think about the potential profit, and places it in a nearby Barber Shop. Within months, he owns three machines in three different locations. The business is sold later in the year for USD 1,200 to a War Veteran. 1947: Warren has earned over USD 5,000 delivering newspapers. His father presses him to attend college, a suggestion Warren does not take well. Nevertheless, that year, he enrolls as a freshman at the Wharton School of Finance and Commerce in Pennsylvania. Buffett hates it, complaining he knows more than the teachers. 1949: Classmates return to find that Warren is no longer enrolled at Wharton. He has transferred to the University of Nebraska. 1949: Warren is enrolled in classes, but has already begun his life. He is offered a job at J.C. Penny´s after college, but turns it down. He graduates from college in only three years by taking his last three credits over the summer. His savings have reached USD 9,800. 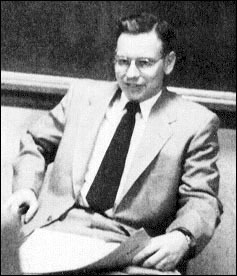 1950: Buffett applies for admission to Harvard Business School and is turned down. He eventually enrolls at Columbia after learning that Ben Graham and David Dodd, two well-known security analysts, are professors. 1951: Warren discovers Graham is on the Board of GEICO insurance. He takes a train to Washington, D.C., and knocks on the door of its headquarters until a janitor lets him in. After asking if anyone is working, he find a man on the sixth floor, who ends up being high up in the company. They talk for hours while Warren questions him on the business and insurance in general. (Buffett now owns GEICO entirely). 1951: Buffett graduates and wants to go to work on Wall Street. Both his father Howard and mentor Graham urge him not to. Warren offers to work for Ben Graham for free... but Graham refuses. 1951: Warren returns home and begins dating Susan Thompson. 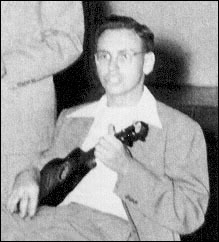 1951: Buffett takes a Dale Carnegie public speaking course. 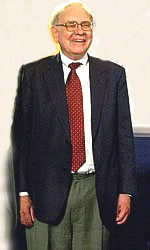 Using what he learnt, he began to teach a night class at the University of Nebraska, "Investment Principles". The students were twice his age (he was only 21 at the time). April, 1952: Warren and Susie get married. They rent an apartment for USD 65 a month, and have their first child, also Susie. 1954: Ben Graham calls Warren and offers him a job at his partnership. Buffett´s starting salary is USD 12,000 a year. 1956: Graham retires and folds up his partnership. Since leaving college six years earlier, Warren´s personal savings have grown from USD 9,800 to over USD 140,000. 1956: The Buffett family returns home to Omaha. On May 1, Warren created Buffett Associates, Ltd. Seven family members and friends put in a total of USD 105,000. Buffett himself invested only USD 100. He was now running his own partnership, and would never again work for anyone else. Over the course of the year, he opened two additional partnership, eventually bringing the number under his management to three. Years later, they would all be consolidated into one. 1957: Buffett adds two more partnerships to his collection. He is now managing five investment partnerships from his home. 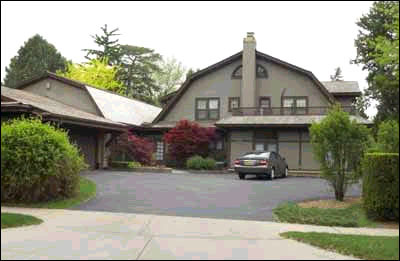 1957: With Susan about to have her third child, Warren purchases a five-bedroom, stucco house on Farnam street. It cost USD 31,500. 1958: The third year of the partnership completed, Buffett doubles the partner´s money. 1959: Warren is introduced to Charlie Munger, who will eventually become the Vice Chairman of Berkshire Hathaway, and an integral part of the company´s success. The two get along immediately. 1960: Warren asks one of his partners, a doctor, to find ten other doctors who will be willing to invest USD 10,000 each into his partnership. Eventually, eleven doctors agreed to invest. 1961: With the partnerships now worth millions, Buffett made his first USD 1 million dollar investment in a windmill manufacturing company. 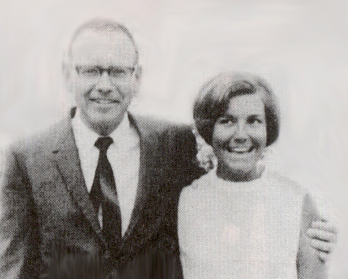 1962: Buffett returns to New York with Susie for a few weeks to raise capital from his old acquaintances. During the trip, he picks up a few partners and several hundred thousand dollars. 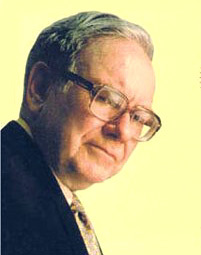 1962: The Buffett Partnership, which had begun with USD 105,000, was now worth USD 7.2 million. Warren and Susie personally own over USD 1 million of the assets. Buffett merges all of the partnerships into one entity known simply as Buffett Partnerships, Ltd. The operations are moved to Kiewit plaza, a functional but less-than-grand office, where they remain to this day. The minimum investment is raised from USD 25,000 to USD 100,000. 1962: Buffett consults Munger on Dempster, the windmill manufacturing company. 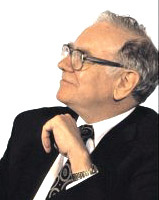 Munger recommends Harry Bottle to Warren; a move that would turn out to be very profitable. Bottle cut costs, laid off workers, and caused the company to generate cash. 1962: Warren discovers a textile manufacturing firm, Berkshire Hathaway, that is selling for under USD 8 per share. He begins to buy the stock. 1963: Buffett sells Dempster for 3x the amount he invested (The almost worthless company had built a portfolio of stocks worth over USD 2 million alone during the time of Buffett´s investment). 1963: The Buffett partnerships becomes the largest shareholder of Berkshire Hathaway. 1964: Due to a fraud scandal, American Express shares fall to USD 35. 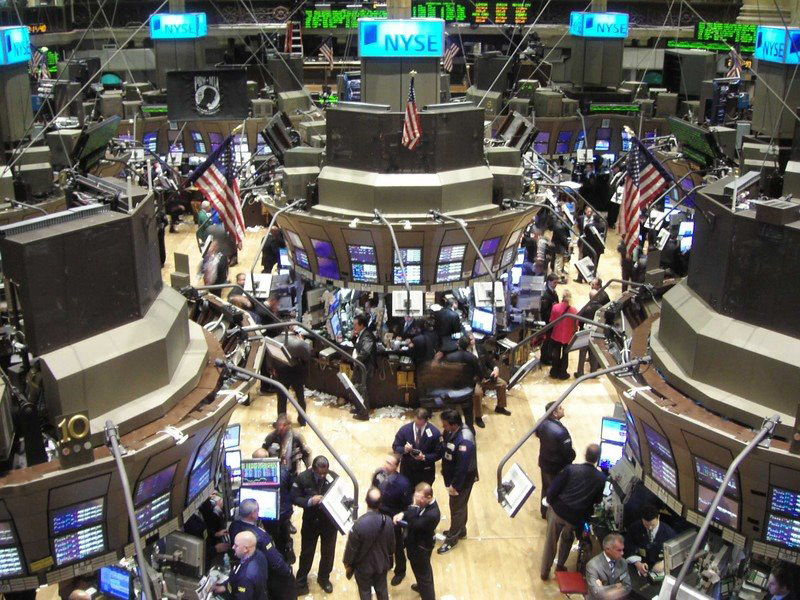 While the world is selling the stock, Buffett begins to buy shares en masse. 1965: Warren´s father, Howard, dies. 1965: Buffett begins to purchase shares in Walt Disney Co. after meeting with Walt personally. Warren invested USD 4 million (which was equal to around 5% of the company). 1965: The American Express shares which were purchased shortly before are selling for more than double the price Warren paid for the them. 1965: Buffett arranges a business coup - taking control of Berkshire Hathaway at the board meeting and naming a new President, Ken Chace, to run the company. 1966: Warren´s personal investment in the partnership reaches USD 6,849,936. 1967: Berkshire pays out its first and only dividend of 10 cents. 1967: In October, Warren writes to his partners and tells them he finds no bargains in the roaring stock market of the 60s. His partnership is now worth USD 65 million. 1967: Buffett is worth, personally, more than USD 10 million. He briefly considers leaving investing and pursuing other interests. 1967: American Express hits over USD 180 per share, making the partnership USD 20 million in profit on a USD 13 million investment. 1967: Berkshire Hathaway acquires National Indemnity insurance at Buffett´s direction. It pays USD 8.6 million. 1968: The Buffett Partnership earns more than USD 40 million, bringing the total value to USD 104 million. 1969: Following his most successful year, Buffett closes the partnership and liquidates its assets to his partners. Among the assets paid out are shares of Berkshire Hathaway. Warren´s personal stake now stands at USD 25 million. He is only 39 years old. 1970: The Buffett Partnership is now completely dissolved and divested of its assets. Warren now owns 29% of the stock outstanding in Berkshire Hathaway. He names himself chairman and begins writing the annual letter to shareholders. 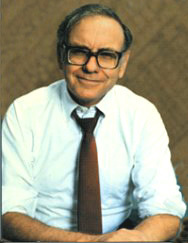 1970: Berkshire makes USD 45,000 from textile operations, and USD 4.7 million in insurance, banking, and investments. Warren´s side investments are making more than the actual company itself. 1971: Warren (at his wife´s request), purchases a USD 150,000 summer home at Laguna Beach south of Los Angeles. 1973: Stock prices begin to drop; Warren is euphoric. At his direction, Berkshire issues notes at 8%. 1973: Berkshire begins to acquire stock in the Washington Post Company. 1974: Due to falling stock prices, the value of Berkshire´s stock portfolio began to fall. Warren´s personal wealth was cut by over 50%. 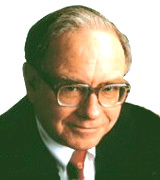 1974: The SEC opens a formal investigation into Warren Buffett and one of Berkshire´s mergers. Nothing ever comes of it. 1977: Berkshire indirectly purchases the Buffalo Evening News for USD 32.5 million. He would later be brought up on antitrust charges by a competing paper. 1977: Susie leaves Warren, although not officially divorcing him. Warren is crushed. 1978: Susie introduces Warren to Astrid, who eventually moves in with him. 1979: Berkshire trades at USD 290 per share. 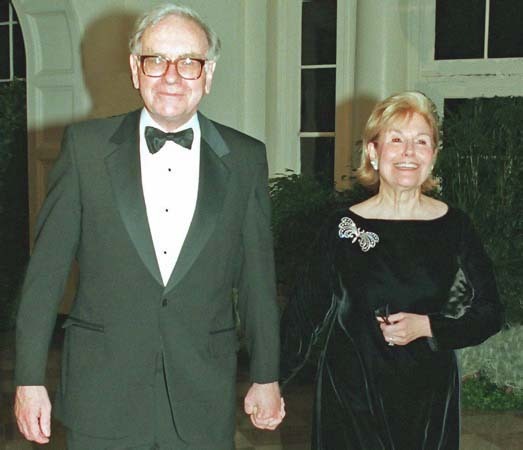 Warren´s personal fortune is approximately USD 140 million, but he was living solely on a salary of USD 50,000 per year. 1979: Berkshire begins to acquire stock in ABC. 1981: Munger and Buffett create the Berkshire Charitable Contribution plan, allowing each shareholder to donate some of the company's profits to his or her personal charities. 1983: Berkshire ends the year with USD 1.3 billion in its corporate stock portfolio. 1983: Berkshire begins the year at USD 775 per share, and ends at USD 1,310. Warren´s personal net worth is USD 620 million. He makes the Forbes list for the first time. 1983: Buffett purchases Nebraska Furniture Mart for USD 60 million. It turns out to be one of his best investments yet. 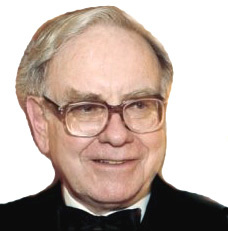 1985: Warren Buffett became a billionaire, his stocks were more worth than one billion dollars. The price of BRKA share was 2.600 USD. Wurde Milliardär, seine Aktien waren 1985 mehr als eine Milliarde Dollars wert. 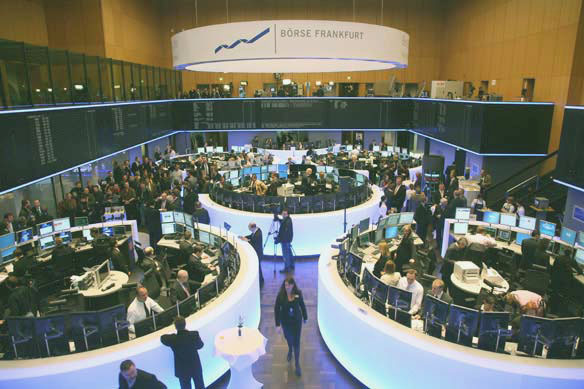 Kurs der Aktie BRKA war 2.600 USD. 1985: Buffett finally shuts down the Berkshire textile mills after years of sustaining it. He refuses to allow it to drain capital from shareholders. 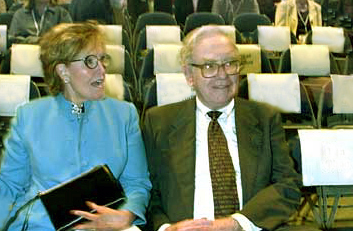 1985: Buffett purchases Scott & Fetzer for Berkshire´s collection of businesses. It costs around USD 315 million, and boasts such products as Kirby vacuums and the World Book Encyclopedia. 1986: Berkshire breaks USD 3,000 per share. 1987: In the immediate crash and aftermath of October, Berkshire loses 25% of its value, dropping from USD 4,230 per share to around USD 3,170. 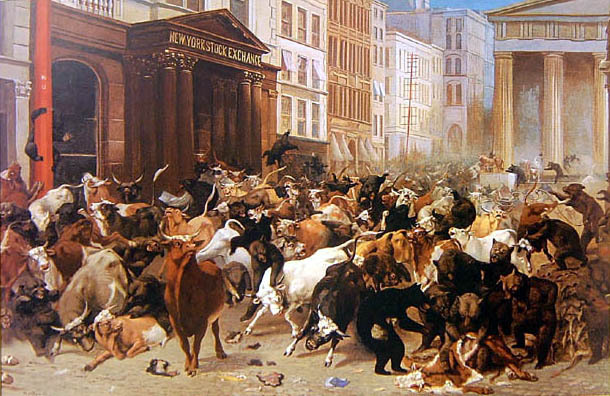 The day of the crash, Buffett loses 342 million dollars personally. 1988: Buffett begins buying stock in Coca-Cola, eventually purchasing up to 7 percent of the company for USD 1.02 billion. It will turn out to be one of Berkshire´s most lucrative investments. 1989: Berkshire rises from USD 4,800 per share to over USD 8,000. Warren now has a personal fortune of USD 3.8 billion. 1999: Index Nasdaq grew +84%, but Berkshire Hathaway stock fell -30%. 2000-2002: during the big crash of stocks index Nasdaq -84% fell in 1/6. 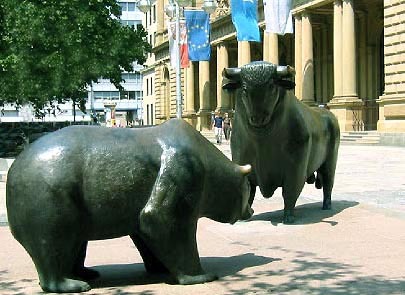 Dow Jones index fell -38% in 1/3. Stock BRKA fell -48% in 1/2 and fell only in the years 1999-2000, from maximum 80 300 dollars to minimum 41 300 dollars. 2004: Berkshire Hathaway holding has created a class B stock BRK.B as 1/30 of A class BRK.A. 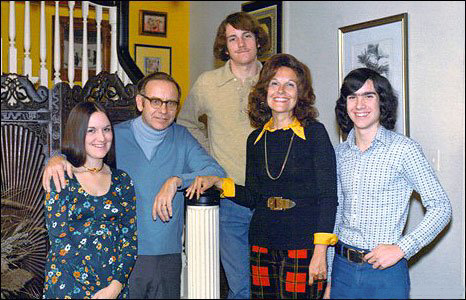 2004: July 29, Thursday : Susan Thompson Buffett, the wife of billionaire investor Warren Buffett and a director in his company died of a stroke while visiting friends in Cody, Wyoming. She was 72. She had stocks for 3 billion dollars. 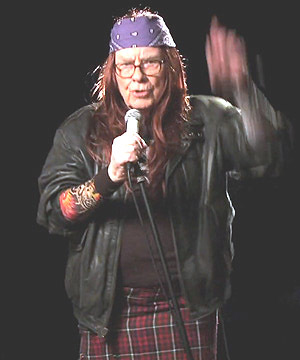 Warren was with his wife when she died. 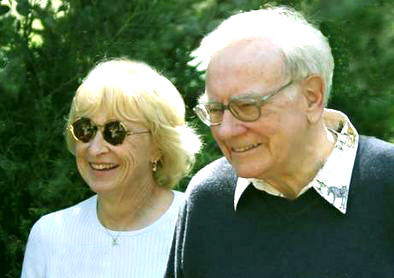 2006: August 30, Wednesday : Warren Buffett (76) married Astrid Menks (60). 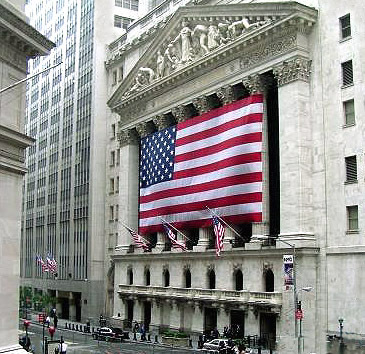 2007-2009: during the big financial crisis index Nasdaq fell -54%. Dow Jones index fell -54% too. Stock BRKA fell -51% in 1/2 and fell from maximum 149 200 dollars to minimum 72 400 dollars. 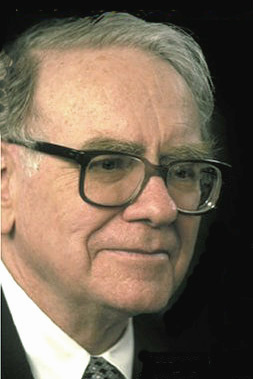 Young, gifted and black, boy Warren Buffett with 2 years, 5 years, 18 years , 19 years, 20 years, 35 years, 50 years, 60 years, 70 years, 80 years old.
! ! ! 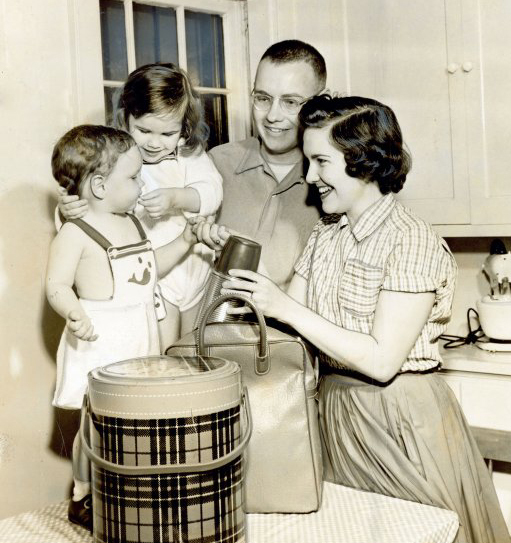 Warren Buffett, Susan Buffett, daughter Susie and son Howard 1956 ! ! ! 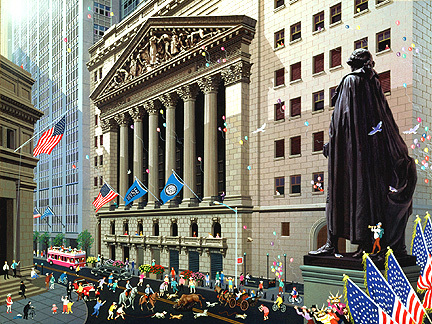 Warren Buffett to Barack Obama said: "What do you think of my new Yankee Doodle?" 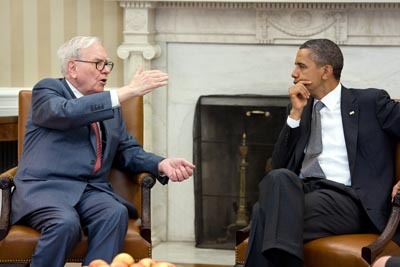 Warren Buffett said to Barack Obama: "I saw a black man, he had it so long."